From the Meyer Werft shipyard in Papenburg, Germany Royal Caribbean announced all its technology offerings for the upcoming cruise ship Quantum of the Seas. The new features which will be available for the ship will make it even more innovative than it already is and many of them are cruise industry firsts. The 167,800 ton Quantum of the Seas is known as the “SmartShip” as the cruise line has announced six new features which evolve around technology. A Quantum vacation begins at home, where guests can generate boarding documents online, upload their own ID photo, and receive digital boarding confirmation. By the time they arrive at the cruise terminal for departure, Royal Caribbean guests can go from “sidewalk to ship” in 10 minutes with no check-in counter, no forms to fill out and no lines to stand in. Guests will be able to track luggage in real time on their smartphones. Luggage will be tagged curbside with RFID technology at drop-off, and guests can monitor their bags’ progress through key points en route to the stateroom. On departure, the process is reversed. Quantum of the Seas will offer new RFID WOWband wristbands, which require only a simple tap to quickly navigate the ship, make onboard purchases, serve as the room key and more. Quantum of the Seas will operate with unprecedented bandwidth using satellites launched by tech partner O3b Networks. With speeds that match fast broadband connections onshore, guests can be online 24/7, no matter what personal device they bring onboard. Guests can watch streaming video, check email, share images on social media and enjoy face-to-face video conversations – even in the middle of the ocean. In addition, Quantum’s connectivity makes it possible for one of the SeaPods in SeaPlex to become a live global video gaming suite where guests can enjoy Xbox Live and compete with other gamers worldwide. Technology also powers surprise-and-delight elements on Quantum of the Seas. A brand new venue, Bionic Bar, is set to make waves with robots at center stage. Guests place orders via tablets and then have fun watching robotic bartenders hard at work mixing cocktails. 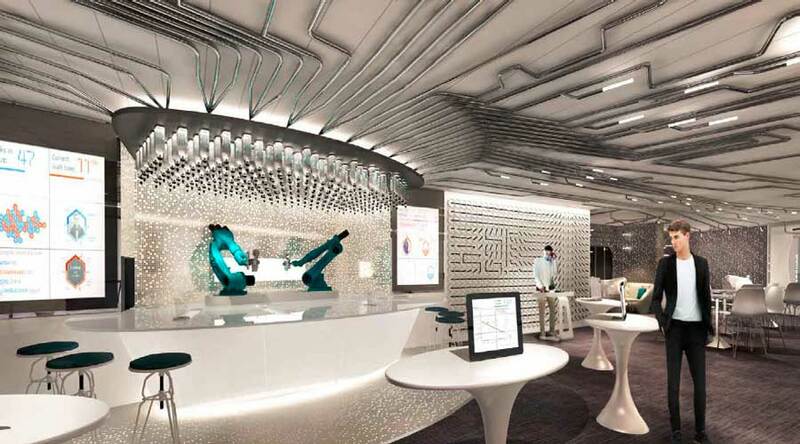 Robots drive another entertaining feature on Quantum of the Seas. Two70 is home to a playful and agile troupe of six Roboscreens that stage surprise performances during every cruise, creating scenes while soaring and twisting solo, or uniting as one. Guests will also experience Vistarama, floor-to-ceiling glass walls that transform into an expansive ambient surface that projects any scene, real or imagined, including the multidimensional performance spectacle, Starwater. Quantum of the Seas will take advantage of technology in functional forms as well. Guest staterooms are equipped with device-charging USB outlets, as well as energy efficient and environmentally friendly lighting systems. Interior accommodations are outfitted with Virtual Balconies that display real-time sights and sounds of the sea through 80-inch LED screens, ensuring every stateroom has a view. The technology benefits of Quantum of the Seas extend to the ship’s crew. Custom apps will allow crew members to keep better track of guests’ tastes and preferences, allowing staff to tailor their already remarkably personalized service to an even higher degree. Whether a guest prefers gluten-free dining, early show seating, or shiatsu massage, the features of the smart ship allow crew members to anticipate every need. And the ship’s remarkable capabilities give the company an opportunity to make life better for crew members too, since Royal Caribbean will present every crew member on Quantum of the Seas with a free, personal Microsoft Windows tablet, with a suite of services and apps that is theirs to keep. And as technology upgrades are made across the company’s fleet, every shipboard employee in the entire Royal Caribbean International fleet will also receive their own tablet – a total of 40,000 tablets. Quantum of the Seas will offer all these new features when Meyer Werft deliver the vessel to Royal Caribbean in November 2014 and then it will begin its inaugural sailings from New York.